If you’re an outdoorsman that takes frequent hikes and trips into the great unknown, you’ll benefit greatly from having an ABC watch. ABC (altimeter, barometer, and compass) watches have enough information on them to allow you to react to any situation without fail. Our ABC watch buying guide will help you choose the perfect watch for you! But, of course, there are some critical features that you need to know about. After, check out the products! Waterproof: When a watch is waterproof, you can take it with you while swimming or showering. Some can even work while you’re scuba diving, as long as you don’t press any buttons while the watch is submerged. Case Diameter: This is the size of the face of the watch or the part that holds all of the fancy features that you’re looking for. A larger face is easier to see at a distance, or when you’re active. 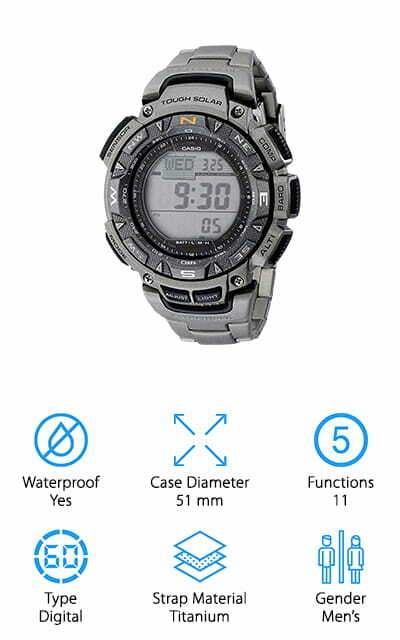 Functions: This is the number of functions that the watch was available. These are things like alarms, different time zone displays, calendars, and battery power indicators. Make sure you know all of the amazing things your watch can do! Type: There are two types of watches on this list: digital clocks, which display the time as numbers, and analog clocks. Analog is the standard format where the hands tick around the numbers on the face of the watch. Strap Material: Resin is by far the most popular strap material on our list. It’s pliable and won’t be uncomfortable to wear over time. Nylon and silicone are equally popular for the same reasons. Other options are polyurethane and titanium. Gender: This only refers to whether the watch was intended for men, women, or both. Some watches have specific band sizes for whether they are men’s or women’s watches, but for the most part, this is personal preference. Now we can get to our ABC watch reviews! One of these multifunction watches might become your new constant companion on through hikes and camping trips, so we’ve only compiled the best watches we could find. If you’re in a hurry, take a look at our top pick and our budget pick, but don’t hurry off just yet. There are plenty of amazing watches throughout our list as well, and one might be your perfect choice! Our top pick for one of the best ABC watches for sale is this Casio Pathfinder. Casio is a very popular name in watches, perhaps the most popular for casual wearers. This particular outdoor watch is solar-powered, which we think is a pretty cool feature. A full battery charge will last for six months if it is operated completely away from sunlight! Chances are, this watch is never going to die on you. 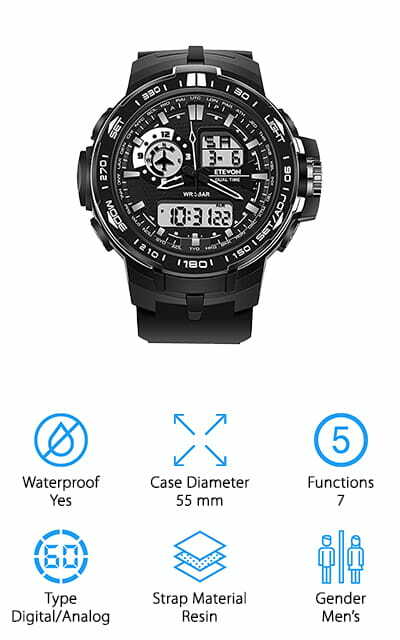 In addition to the compass, altimeter, and barometer, this watch also includes a thermometer, five daily alarms that you can set independently, the city code display, as well as an automatic calendar that is pre-programmed until 2099. The band is made of resin and closes with a buckle so it won’t slip off. Our favorite feature is the battery power indicator! It’s water resistant to 330 feet, so you can take it swimming with you. On top of that, the case is a huge 55mm! Our choice for one of the best cheap ABC watches. This is one of seven different colors available for the LAD Weather sports watch. Instead of being a white background with black numbers, this display is negative, which means that it’s black with white numbers. It looks slick and is easy to read! 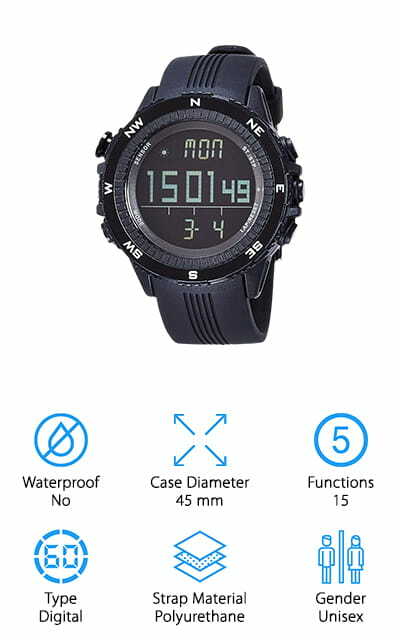 This product has a lot more features that other cheap ABC watches have, including a chronograph, lap timer, thermometer, and track mode which is a measure of relative altitude – otherwise, how much altitude you gain or lose over the course of your activity. It also includes a weather forecast, which we think is a really nice feature when you’re enjoying yourself outdoors. Never get caught in the rain on a hike again! You’ll have plenty of time to set up your tent before it starts to pour. There are also two individual alarms you can use. The case is 45mm wide, easy to see and classic. This Pro Trek PAG watch is solar powered, a popular feature that will serve you well during your outdoor activities. The triple sensor is what provides all of the information you’re looking for out of an ABC watch: the altimeter, barometer, compass information, as well as the thermometer so you can tell what temperature it is. It also has low-temperature resistance so you can use it on winter outings as well as summer ones. There are 31 time zones you can display, five daily alarms, and a chime that can go off at the top of every hour. The movement is traditional, accurate quartz inside, but the display is a digital numbers display. The band is titanium and includes a double-locking fold-over clasp to make sure that it won’t fall off. It’s water resistant to 330 feet, so you can even take it swimming and snorkeling with you! We love all of the features packed into this watch! One of the best ABC watches on our list is this Etevon Air Force watch. The first notable thing about this watch is the Air Force design, which includes wing-shaped watch hands. The entire look of this watch is exceptional and great for someone who loves aviation! The glass on the face of the watch is scratch-resistant acrylic crystal glass, which won’t be dinged up no matter what type of activity you’re using this watch for. It’s waterproof for rain and showering, as well as swimming. It’s shockproof and won’t freeze in lower temperatures, so you won’t have to worry about any type of weather. It’s got a dual time display, a pre-programmed calendar, and a chime that will go off every hour. This is in addition to the altimeter and barometer functions that help you determine when it’s going to storm. As far as ABC watches go, this one looks great and functions well. The Suunto Core is one of the most famous and widely-awarded watches today! There are so many things that make this watch a desirable outdoor altimeter watch, and that includes the wide range of features! It of course also has a barometer and compass, which provides information and predictions about the weather, so you can get a warning before it turns bad. It includes a projected time for sunrise and sunset, as well as the coveted storm alarm and a depth meter specifically for snorkeling. There are many more functions that the watch itself carries, including timers and alarms that you can set to go off at different times and operate individually. The menu is multilingual, and you can easily replace the battery yourself. 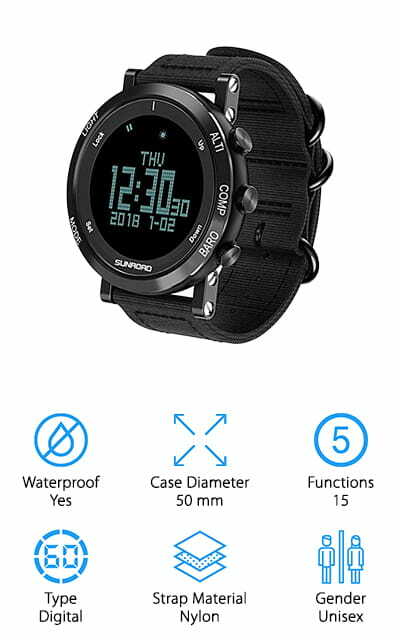 It’s a great outdoor watch that you can rely on when you hit the trail or camp without worry that you’re going to run into anything unexpected. It is both essential and stylish! 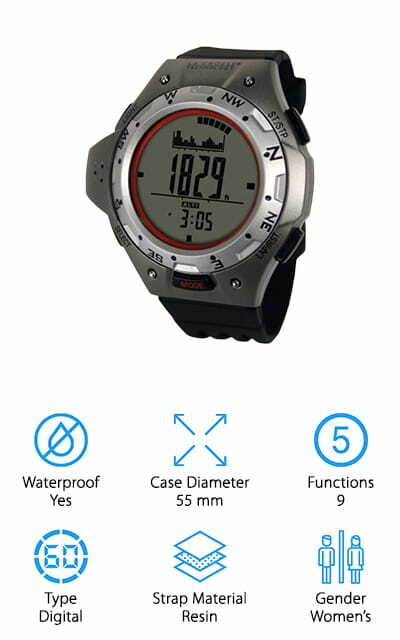 This multifunctional barometer watch by Pyle is a great companion for your outdoor adventures! It measures the altitude levels and shows you the sea level pressure as well as the minimum/maximum altitude. The calendar is pre-programmed. What’s really unique about this watch is the internal memory, which is unique to this piece. You can store up to 34 hours of history data for altitude, temperature changes, and pressure. There’s a countdown timer you can use as well, including a weather forecast and storm alert, and displays for the day of the week and the time down to the second in digital format. There are notes that will sound when you press the buttons, which is a nice touch, as well as the hourly chimes. The calendar is pre-programmed so you’ll never have to worry about programming it yourself. The weather is displayed with four different easy-to-understand symbols, and we love the simplicity of that design. 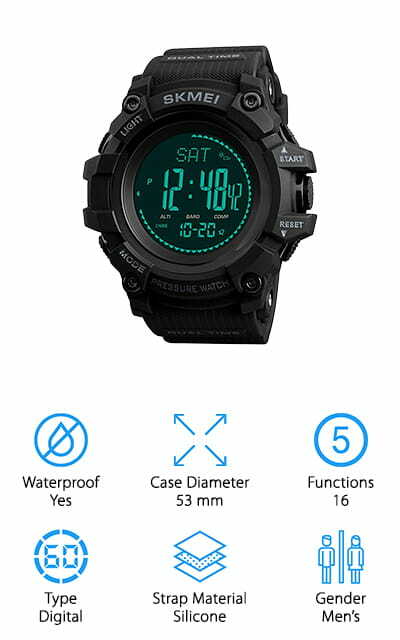 This digital compass watch by La Crosse Technology is a good choice for either outdoor adventures or urban ones! It’s water resistant to about 30 feet, which is going to be okay for some light swimming, showering, and washing your hands. The display is digital, so it’s easy to read on the go. 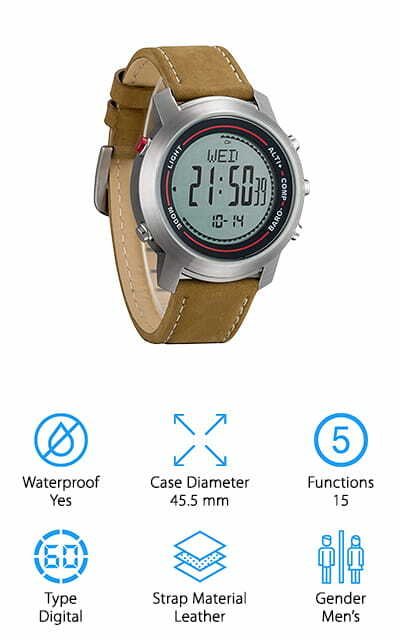 It has an altimeter mode, a barometer mode, as well as compass and chronograph modes. You can use the countdown timer for a variety of things, and it is able to be quickly set. It can display dual times and will save up to 100 laps in the stopwatch function. There are also 2 altimeter alarms that will sound when you pass a certain altitude or pressure band, which is a pretty neat feature if you’re climbing a mountain or hiking at a great distance. And this watch does more than just function wonderfully – it also looks great, and will go with any outfit! This multi-function watch by Sun Road has a special feature that isn’t found in most other watches on this list: a pedometer. That’s right, this watch will count your steps! That makes this a great watch for hiking, jogging, or even long walks! IT’s waterproof down to 160 feet, which means that you can take it with your swimming or snorkeling, but you should probably leave it on the shore if you’re going to be scuba diving. It’s a comfortable fit and will be useful for a bunch of different outdoor activities! Some of the features besides the pedometer include a log record, thermometer, and sunset and sunrise times. You can store a lot of laps or times in this watch with its internal memory function. It’s a great fitness watch as well, and looks great no matter what you’re doing when you’re wearing it! We love how practical this watch is, and the number of functions! The SKMEI survival watch is both sleek and simple and extremely functional, including a host of features that will work with your sport! It’s water resistant to 99 feet, so you can shower with it on but should take it off to swim. The band is made of black silicone, so it’s soft and it will not be uncomfortable to wear. It’s shockproof and includes a fitness mode that counts steps, calories, and distance. Out of fitness mode, it includes the usual altimeter, barometer, and compass, as well as the weather forecast, a backlight, 2 alarms and dual time displays. You can also use it as a stopwatch. The watch is digital, but it uses quartz movement to be as accurate as possible, so you’re never late or too early for any event. The case is an amazingly large 53mm wide, so you can read the display quite a ways away. We love this military-style watch! The Spovan Sports Watch is another military design, and that’s why we’re including it as a tactical watch. It looks great, has a leather band that won’t pull your skin or is uncomfortable, and the best part is that it matches just about every different clothing style you could hope to have! It has a weather forecast as well as a backlight, dual timekeeping, a pedometer, and a stopwatch for keeping your own personal scores saved. It’s waterproof up to 165 feet so you can swim with it as long as you don’t press any buttons while submerged. It has a Swiss sensor on it, as well as a modest 45.5mm case. 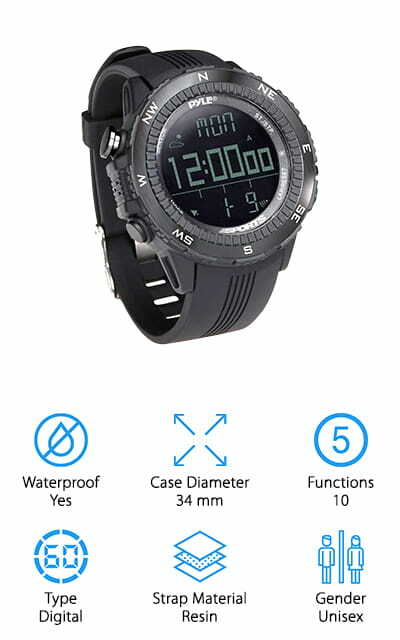 This is a great watch for any mission or other outdoor activity that you might use it for! 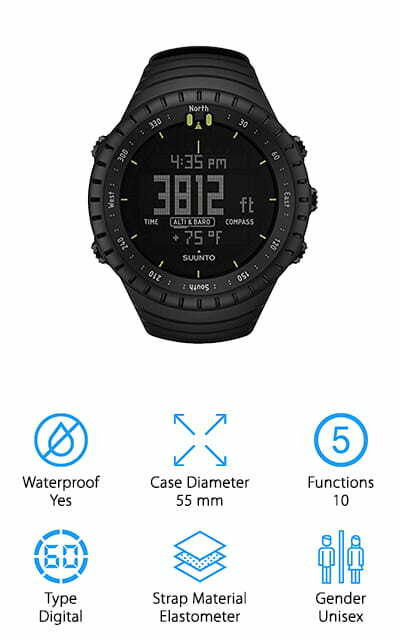 You can safely go hiking, camping, and climbing with this feature-packed, useful watch! We love the universal style as well as the groups of alarms!